PASCO FIX industrial glue is a high-quality product of modern chemistry. It is a true sensation in the field of adhesive technology! PASCOFIX industrial glue is the result of long standing research and professional fabrication. The company PASCO has been working on the development and production of high-performance adhesives for more than 30 years. 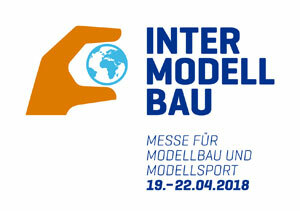 The versatility was developed by the special demands and in close cooperation with our customers, to achieve the best possible adhesive for each specific use. PASCO adhesives are used in many areas, for example, automobile industry, boatbuilding, electrical industry, modelbuilding, workshop, dental technology, optical and jewellery industry, hobby, trade, household etc. We support the most popular online payments. In a few steps, safely to your product. The advantages of PASCOFIX INDUSTRIAL GLUE? Our patented long-life formulation leads to a very long lifeperiod of our glue, compared to conventional glue. If the glue is stored in a place that is cool (below 12°C), dark, and above all, dry, storage is warranted for several years without loss of quality. PASCOFIX industrial glue is suitable for 94% of all materials. It glues rubber, metal, wood, synthetic material*, porcelain, ceramic, glass, FBE, leather, stone ... with each other and among each other. Even parts which are subject to high and permanent strain can be welded with our bonding system. 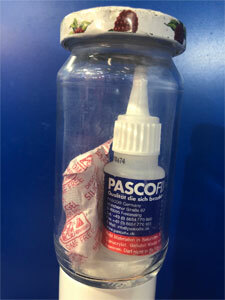 PASCOFIX industrial glue has an unexampled effectivity and a signifacantly stronger adhesive power than conventional glue. No compounding by combination of materials and immediately usable. Our glue can be applied universally and efficiently, whether in household, handicraft, trade or industry. 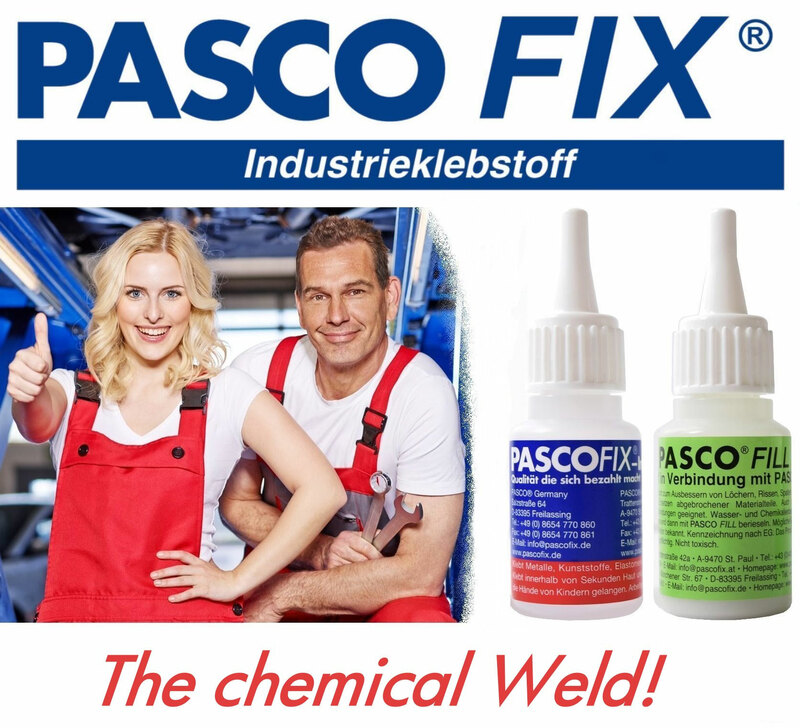 The combination of PASCO FILL filler material and PASCO FIX industrial glue leads to a chemical weldseam within seconds. The glued parts seem to be welded together and are therefore extremely resilient, for example cold- and heatresistant, watertight and weather-resistant. Broken objects which can be repaired do not need to be replaced, which saves time and money.